When you crawl space has problems with moisture seepage, it can create several forms of damage. Excess humidity and moisture below your home can contribute to rotting wooden structures, including wooden supports and floor joists. It’s important to remember that those wooden beams, supports and joists partially carry the weight of your house. When the beams begin to rot, you may notice sloping floors and sloping rooms. Additionally, water present in a basement or crawlspace will encourage the development of mold and mildew, which are widely known to to be to blame for a variety of health-related problems. 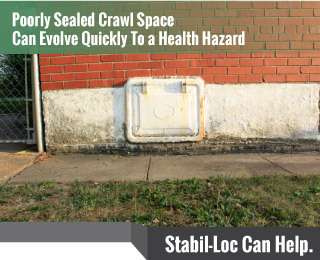 You should be enjoying the advantage of drain tiles, which are a reliable crawl space drainage system. These waterproofing systems mitigate water from invading the basement under your home and causing damage to wooden beam and joists located beneath the house. Our drain tile system consists of a buried pipe which is laid into a gravel-filled cavity dung along the outside of your foundation. Whenever precipitation from the soil seeps into the gravel area, it seeps into the pipe. Once inside the pipe, the runoff will be diverted into a sump pump which will efficiently pump the water out and away from the homes foundation to a safe distance away . To assist with high humidity in the crawl space, we can install an automated dehumidifier to remove moisture from the air. You can help protect the value of your home for years to come by quickly addressing and repairing foundation and basement issues as they occur. Among our city’s foundation repair firms, our Stabil-Loc Authorized Dealers are widely known for their excellent customer service and commitment to professionalism. Our experienced team of foundation repair contractors is ready to take care of any structural problems beneath your home.